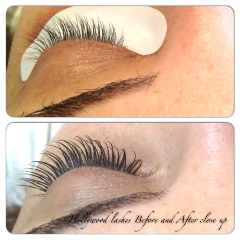 Express Eyelash Extensions take approximately 40 mins to apply and will last approximately 2 weeks with care. They require no maintenance and look extremely natural. “Semi Permanent Eyelash Extensions – These amazing new lash extensions are naturally curled, look gorgeous but also feel weightless on your eyes. The lash is C, D or J shaped to emulate the natural lash. This means the lash does not have a ‘bobble’ on the end and this lash fits snugly to your natural lash giving an even and natural appearance. Once applied, lashes can last up to two months with maintenance recommended every 2/3 weeks. The adhesive used during the treatment is medical grade and is permanent. The lash extension will only come out when the natural lash falls out at the end of its life cycle. These lashes are water resistant, meaning you can shower, swim, cry and sleep without worry. These lashes will enhance your natural lashes, and are ideally suited for weddings, parties, holidays and special occasions as well as normal every day wear. Because the eyelash extensions are applied individually to each lash the procedure could take anywhere between an hour to three hours, but the results are definitely worth it. Semi-permanent eyelash extensions. These will give you fabulous natural looking lashes that can last up to two months. Recommended maintenance is every 2 weeks. Suitable for everyday wear, ideal for weddings, parties, holidays and special occasions. Maxim lashes are individual flare lashes made up of several natural lashes joining together in a cluster. False lashes are no longer for just celebrities and models, today they are worn by anyone who desires to look fabulous and have extra long or fuller lashes. This Revolutionary new product is used to lift eyelashes, creating length and volume to maximize your natural lash without the need for mascara or lash extensions. It brightens and lifts your eyes giving a more youthful and radiant impression. This natural and low-maintenance treatment can be used to straighten overly curly lashes or to curl straight lashes. The lash perm is a semi permanent method of curling your lashes which completely transforms the eyes without the use of mascara or lash curlers. Even short straight sparse lashes can benefit from this revolutionary treatment, making lashes look longer and thicker for up to three months. Using a small roller and water-soluble glue, the lashes are rolled and separated to help ensure a beautiful natural appearance. Perming lotion is then applied to the lashes and left for 10/15 minutes followed by the application of a setting lotion. This is then left for a further 10/15 minutes under cover. 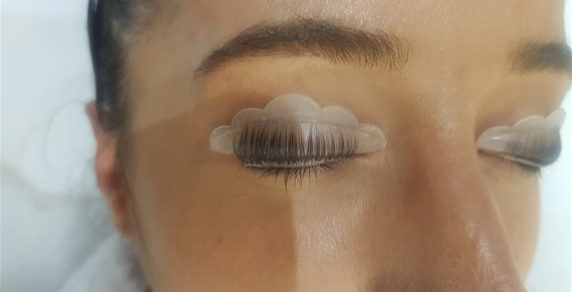 Finally, damp cotton wool is used to gently remove the roller, leaving you with enhanced curled eyelashes. * A patch test for tinting is required 24 hours prior to treatment.